These projects represent a sample of SERC's work, chosen to showcase how we support educators, disseminate information and engage the community through the use of workshops, websites, evaluation, research and online tools. To learn more please visit the full lists of all SERC projects and publications. Combining an ethnographic approach with an evaluation study, the Tracer project investigated the impact of professional development activities on faculty teaching and student learning. SERC researchers worked with collaborators at Carleton College and Washington State University to develop techniques for assessing changes in teaching and learning using faculty evaluation of assignments and student work. The study shows the largest impacts of professional development is the spread of ideas, values, and practices across the campus. This work is summarized in an article in Change: The Magazine of Higher Learning, May/June 2012: Faculty Professional Development and Student Learning: What is the Relationship? (Rutz, C., Condon, W., Iverson, E., Manduca, C., Willett, G.) ; the methods are described in an article in Assessing Writing, Vol. 20. April. p. 19-36: Measures matter: Evidence of faculty development effects on faculty and student learning (Willett, Gudrun, Ellen Iverson, Carol Rutz, and Cathryn Manduca). 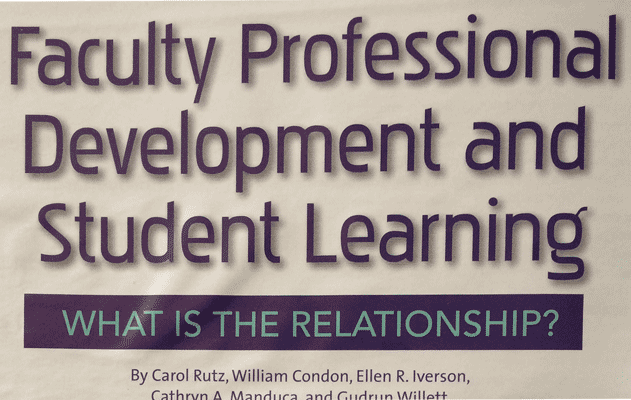 The study is described in its entirety in a forthcoming book: Faculty Development Matters: Connecting Faculty Learning to Student Learning. 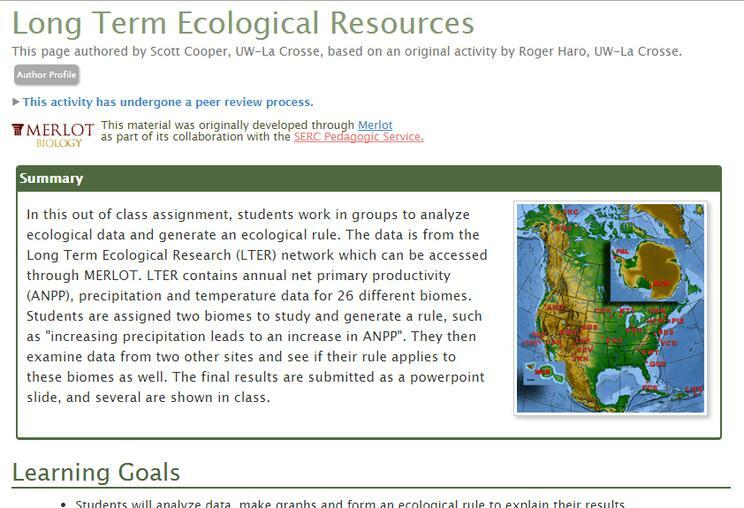 The Pedagogy in Action project, led by SERC, developed a go-to resource on teaching methods for educators in STEM and beyond, pioneering a format that linked information on pedagogy to examples of its use across disciplines. Educators searching for activities to use in their teaching can find activities linked to information on the underpinning methods and the research on their effectiveness. Educators searching for pedagogic information can find ways to transfer these techniques into their teaching. Novel features of Serckit, our content management system allow individual communities to integrate pedagogies into their own sites with customized example collections. 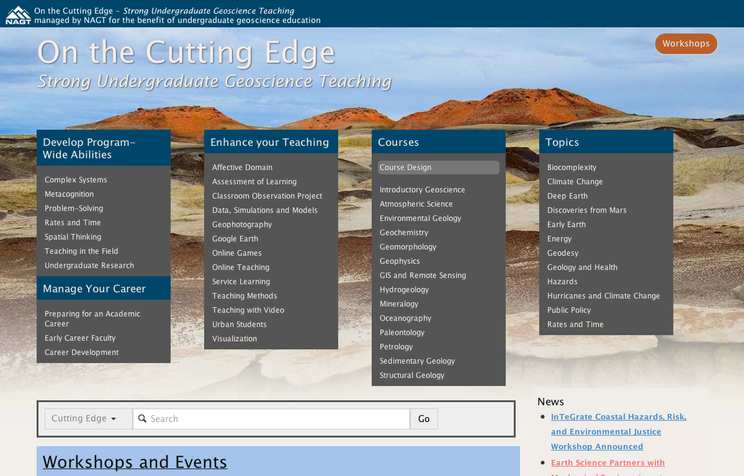 The site now includes information on more than 50 student-centered teaching methods with more than 1,200 activities and reaches more than 1 million visitors each year. SERC serves as the Executive Office for the National Association of Geoscience Teachers, providing a full set of services for this 1,300 member professional society. Our Serckit tools support integrated management of the Association membership, online information and resources, email communication, and professional development opportunities, creating synergies that enhance support for this community of educators. 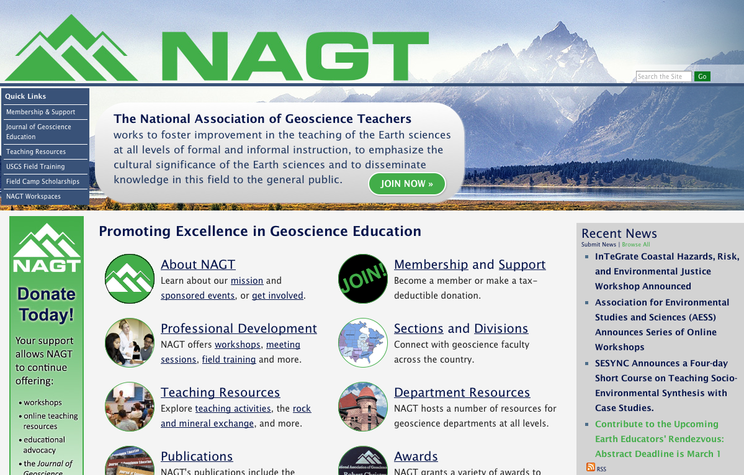 SERC modernized NAGT's web presence and brought it's membership system online. We coordinated the development and publication of In The Trenches, NAGT's member news magazine. SERC manages the day-to-day operations of the organization from facilitating leadership meetings to coordinating awards programs. 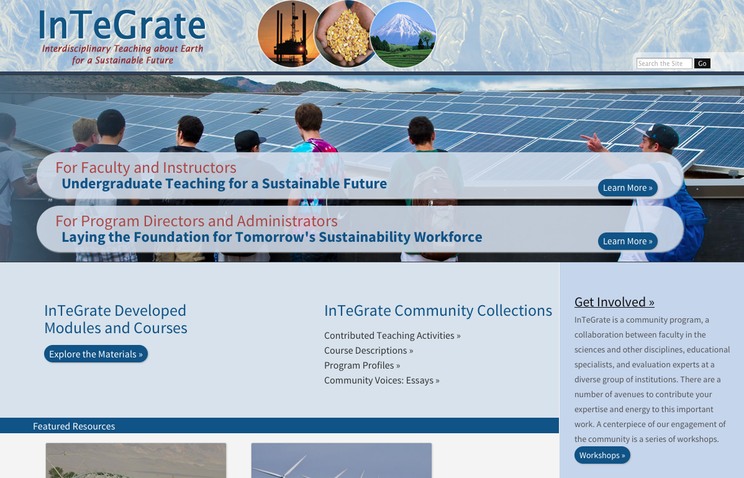 SERC leads the InTeGrate STEP Center as it seeks to transform learning about the Earth in higher education. To increase the number and diversity of students developing Earth 'literacy, InTeGrate focuses on ensuring that teaching integrates science into real-world environmental and resource challenges. The project works on multiple scales to achieve large scale systemic change assisting faculty in transforming their courses; programs in testing new strategies for engaging and supporting students of all types; and a national community of Earth educators who can share successes and challenges. To date, nearly 1,000 educators from across various disciplines are engaged in developing a new breed of tested teaching materials, designing model programs, contributing to the InTeGrate resource collections and participating in community activities. 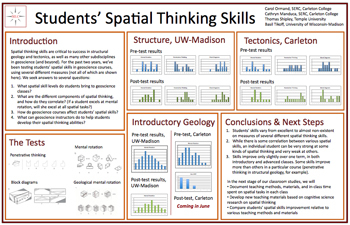 SERC collaborates with SILC , the Spatial Intelligence and Learning Center, in conducting research on spatial thinking and learning in the geosciences. This vibrant collaboration has led to a deeper understanding of how analogy, gesture, and sketching can be used to foster geoscience learning, and particularly the learning of spatial concepts in geoscience. In order to measure students' spatial thinking skills, SERC's Science Education and Research Associate worked with SILC and a team of psychometricians to develop new instruments. The most popular of these is the Geologic Block Cross-sectioning Test. The GBCT is used to assess a person's ability to visualize a slice through a geologic block diagram, and is therefore a domain-specific test of visual penetrative ability. The GBCT is being used to assess spatial thinking skills in geoscience classrooms across the country and in at least one training program in the petroleum industry. 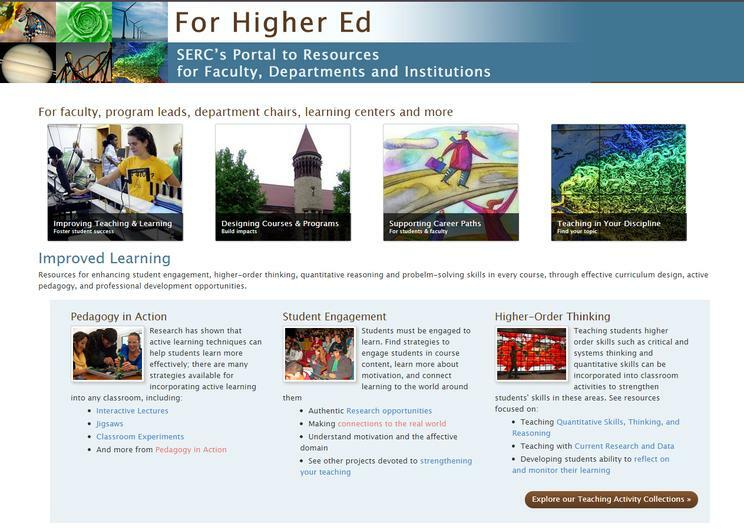 SERC's newest portal For Higher Ed demonstrates our tools for organizing and connecting resources. The portal provides integrated access to resources from multiple projects in an organization scheme that emphasizes current needs and interests in higher education. The portal is developed using standard features in the Serckit content management system allowing easy updating as areas of interest shift or emerge. Integrated faceted searching across all projects hosted by SERC is facilitated by search terms developed and evolved by our collaborators. Recommended links assist site users in moving though related resources from multiple projects. SERC serves as evaluator for two HHMI capstone projects at Carleton College and Grinnell College. At Carleton, the SERC team designed an evaluation plan to assess the three critical features of the HHMI project: 1) broadening access student cohorts, 2) undergraduate research experiences, and 3) HHMI-funded curriculum. 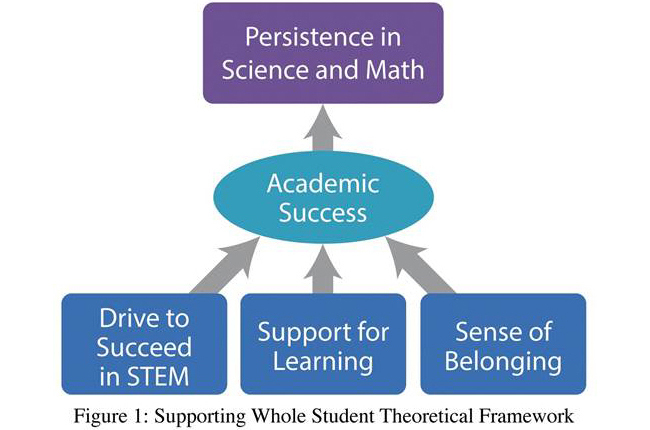 To assess the impact of the two broadening access cohort programs on student success, the evaluation team developed a theoretical model from their study of students' perceived barriers and help seeking behaviors.The study and ensuing evaluation is summarized in an article in the Journal of College Science Teaching, March 2015: Research and Teaching: Broadening Access to Science With Support for the Whole Student in a Residential Liberal Arts College Environment (Gross, Iverson, Willett, and Manduca). Browse the full list of our past and current collaborations. Publications and presentations by SERC staff. If you wish to use this item outside this site in ways that exceed fair use (see http://fairuse.stanford.edu/) you must seek permission from its creator.